Turkish Airlines has implemented two new projects enabling business class passengers to choose their meals before the flight via “Meal selection before flight” service. With this service, applicable to the several intercontinental destinations departing from Istanbul, business-class passengers can view the meal details and visuals of the main dishes and make their choices on the webpage or mobile application. They can make their choices within the period starting from 1 week before their flight date until the last 48 hours. Turkish Airlines passengers who fly from Istanbul to Atlanta, Bangkok, Beijing, Bogotá, Boston, Cape Town, Chicago, Guangzhou, Hanoi, Havana, Ho Chi Minh City, Hong Kong, Houston, Jakarta, Johannesburg, Kuala Lumpur, Los Angeles, Manila, Miami, Montreal, New York, Phuket, Port Louis, San Francisco, Sao Paulo, Seoul, Shanghai, Singapore, Taipei, Tokyo, Toronto, Washington DC, Caracas, Panama City, Madagascar, Durban, Maputo, and Buenos Aires can take advantage of this service. Besides, the airlines’ “Dine on demand service” will be available in all intercontinental night flights departing from and landing on Istanbul. Turkish Airlines will launch a new animated safety video, complete with familiar LEGO minifigures in surprising new roles. The custom-animated safety video for Turkish Airlines was created by the teams who assembled “The Lego Movie”, “The Lego Batman Movie”, “The Lego Ninjago Movie” and the highly anticipated sequel “The Lego Movie 2” due in cinemas beginning February 2019, which reunites the heroes of the first film in an all new action-packed adventure. In partnership with Warner Bros and featuring the popular characters from The Lego Movie franchise, the safety video will be shown on all flights starting today and will also debut online. The safety video, which is the first Lego safety video ever made, demonstrates step-by-step safety procedures to passengers in a fun, unique style – complete with sensible airline-approved humor, celebrity cameos and an unforgettable song and dance number. Turkish Airlines is proud to have one of the youngest fleets in the world and strives to achieve the best in aviation safety standards. Whether frequent travellers or first-time fliers, the video aims to inform and entertain passengers, alongside an extensive selection of movies, TV shows, music and games available in different languages on the in-flight entertainment system. The safety video will kick off the “biggest partnership with the smallest cast ever assembled”, hinting there is much more to come from the Turkish Airlines and Lego Movie franchise alliance. Leading up to the worldwide release of “The LEGO Movie 2”, Turkish Airlines will roll-out a global TV campaign, film themed wrapped airplanes, in-flight and in-airport activations and even a second safety video. 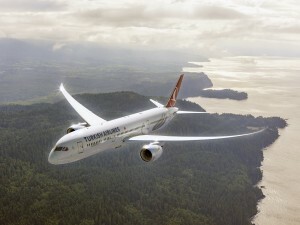 Turkish Airlines’ Turkish Cargo has inked a partnership agreement with ZTO and Pal Air . According to the agreement, a new joint venture will be established in Hong Kong which will provide a range of logistic services. 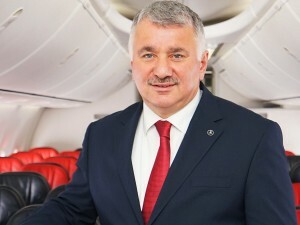 The partnership was sealed and signed by Turkish Airlines Chairman of the Board and the Executive Committee, M İlker Aycı, ZTO Express Chairman Mei Song LAI and PAL Air Ltd. Vice-Chairman Vivian Lau. “Today, I feel privileged to welcome you all for the signing ceremony of a great partnership agreement between the biggest brands of China and Turkey. As Turkish Airlines, ZTO Express and PAL Air Ltd., we are announcing the signing of MoU to build a Joint Venture company to operate as a Global Express/ Courier company mainly focusing on Global E-commerce market with full door to door services. We are now delighted to make this strategic move into Global Express business together with the strong partnership of ZTO, the best and largest Express company from China and our long term cross border forwarding partner PAL Air Ltd. from Hong Kong. The Joint Venture, after reaching quickly to fully functional and operational levels, is expected to take place within the world’s largest integrators. 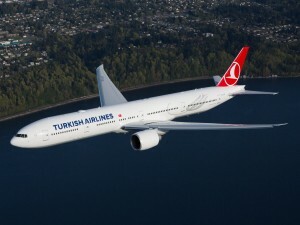 In 5 years’ time it will generate over 2 billion USD of revenue,” said Aycı, Chairman of the Board and the Executive Committee, Turkish Airlines. 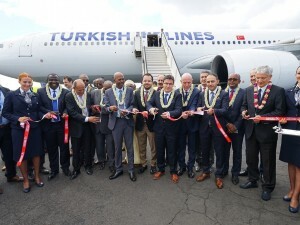 Turkish Airlines flying to the most countries in the world, has added Moroni which is the capital city of Comoros Union to its network on June 18. 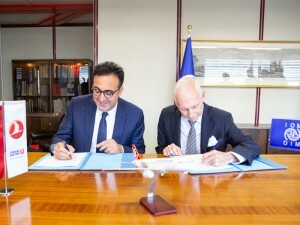 Moroni flights of the flag carrier will be operated three times per week and it will be in connection with Seychelles flights. Comoros Union is consist of three big island which named The Big Comoros , Anjuan and Moholi . 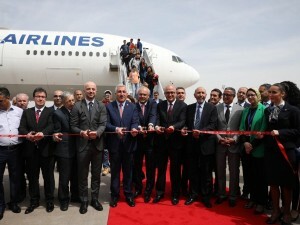 Following the addition of Moroni , Turkish Airlines now reaches 122 countries with 304 destinations worldwide ; 53 of which are in Africa. Comoros was named as moon islands by Arabic mariners and also named perfume islands by European countries because of being plenty various scented plant as honeysuckle,orchid and gardenia. Agriculture sector is the biggest share of country economy and the climate of the Comoros is tropical. Moroni flight time schedules are Monday, Wednesday, Saturday (IST) 01:40 and (HAH)13:30 and Monday, Wednesday, Saturday (HAH) 16:40 (IST) 04:10 +1. Introductory round trip fares are available from Istanbul to Moroni starting at 973 US Dollars (including taxes and fees).